University women to plan activ..
Young Middle Tennessee inventors apparently have developed quite the reputation among national Invention Convention leaders and participants. 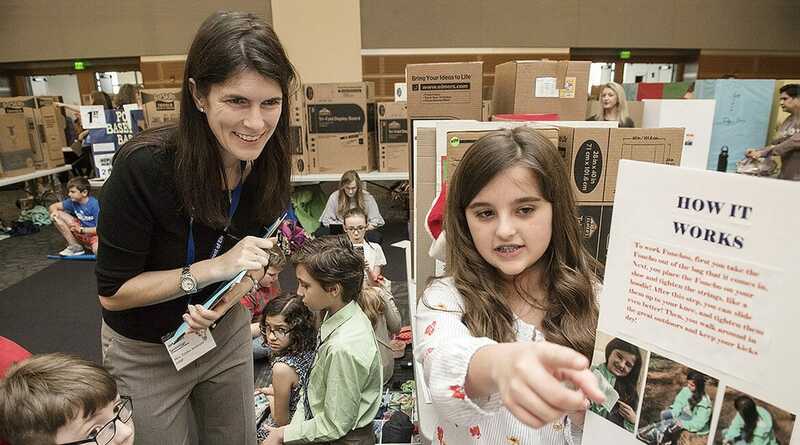 “Tennessee grows some really, really smart kids,” Juli Shively, senior director of outreach for the STEMIE Coalition’s National Invention Convention and Entrepreneurship Expo told more than 800 fourth-, fifth- and sixth-grade geniuses attending MTSU’s 26th annual Invention Convention. Each year, the youngsters create and present inventions from one of two categories —”Games” and “Make Our Lives Easier” — and compete for trophies, ribbons, and for the first time this year, cash awards. Local winners made their mark on the last two years’ National Invention Conventions in Washington, D.C., too, bringing home multiple national honors that include the 2016 Stanley Black and Decker’s “Cool Tool” Award and the 2017 Henry Ford Student Innovators of the Year. The 2018 national event is set May 31-June 2 at the Henry Ford Museum of American Innovation in Dearborn, Michigan. “Everything starts with an idea,” convention director Tracey Huddleston, a professor in MTSU’s Department of Elementary and Special Education, reminded the young inventors. The record 800-plus students from 51 Midstate schools, who developed their ideas for months, were ready to burst when they hauled more than 430 unique gadgets, contraptions and devices into MTSU’s Student Union Feb. 23 to present to judges and await the results. By comparison, Huddleston recalled, the inaugural Invention Convention in 1993 welcomed 56 young inventors and their 42 inventions to MTSU’s James Union Building, enjoying plenty of presentation space in half of the Tennessee Room. Click on the cover to see the 2018 Invention Convention program. You can see a list of the 2018 MTSU Invention Convention winners here. This year’s convention program, which includes the names of all the young inventors, is available here. State Farm Insurance is the longtime local sponsor of MTSU’s annual Invention Convention. Two students also received the inaugural Wil Clouse Eagle Spirit Award, which honors College of Education research professor Wilburn “Wil” Clouse, for their inventions. The prize includes a $200 check from the Clouse-Elrod Foundation. Each Invention Convention also features a guest speaker who encourages the youngsters to embrace their creativity and their imaginations to solve problems. Guests over the years have included astronauts, artists, athletes, musicians, scientists, historians and more. The 2018 guest was Doug Campbell, Unmanned Aircraft Systems operations manager for MTSU’s Department of Aerospace, who explained that the drones used today in ventures as wide-ranging as agriculture, construction, military operations, entertainment, search-and-rescues and commercial deliveries began more than a century ago as a bright idea — just like one of theirs. “Whatever your interests are and the work that you do, have fun and learn as much as you can and keep your creative ideas coming. It’s what brought the technology we have today into existence,” Campbell told the youngsters. Each convention also showcases an everyday object and explains its history as an invention, such as a tape measure, golf ball, USB charger, Frisbee, dice and sunglasses. This year conventioneers learned about the yo-yo from Kyla Patterson, who’s working on a master’s degree in education curriculum and instruction. The toy originated in Egypt in 500 B.C. and made its way across the centuries and the world to be mass-produced in 1928 in the United States; each inventor received a tiny light-up “Invention Convention 2018” yo-yo to take home. “I feel like I’m in the room with some of the smartest people in the state of Tennessee,” Patterson told the young inventors. You can learn more about the event at www.facebook.com/MTSUInventionConvention.